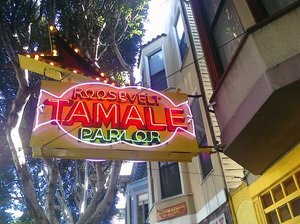 The iconic Roosevelt Tamale Parlor sign; Yelp photo by Marina N.
The cozy room (and Barry’s Caesar salad!) at The Roosevelt Sip N Eat. Photo courtesy of The Roosevelt Sip N Eat. 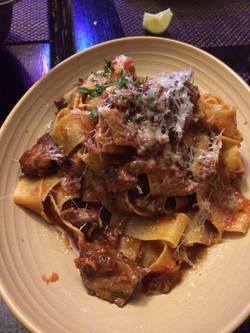 Short rib ragù with pappardelle and pecorino. Photo courtesy of The Roosevelt. It’s funny how things work out sometimes. After making the hard decision to close The Roosevelt Tamale Parlor last December, owners Barry Moore and Aaron Presbrey thought they had a buyer lined up for the restaurant. Well, the deal fell through, and after trying and failing to find other buyers, they decided to reopen the restaurant and do the concept that resonated the most for them. Meet ~THE ROOSEVELT SIP N EAT~. The gents want diners to feel like a guest in their home, a warm place that is casual. It’s like when your friend who really knows how to cook has you over, with really enjoyable wines and beers on the table. The tight bistro-style menu is going to be seasonal, simple, accessible, and refined casual—their motto is “Always thoughtful, never fussy.” Presbrey is going to be moving to back of house and acting as Moore’s sous chef, baking desserts, and managing the beer and wine list. It’s also going to be affordable—you’ll be fed well, whether it’s the roasted Mary’s half chicken ($19) or Duroc pork shoulder ($17) with beet salad, beet greens, pork crackling, and tarragon oil. Barry’s famed Caesar salad will be on the menu ($12), and his love of green chile will be showing up in a curry ($15), with roasted root vegetables and basmati rice. I have a feeling I’ll be coming in for the short rib ragù ($17) with pappardelle and pecorino soon. All entrées will be $20 and under and will change with the seasons. They will be sourcing sustainable ingredients and look forward to having their own Oakland farm plot where they’ll be growing vegetables and more. The wine list is going to have some great pricing, and they want to offer some lesser-known alternatives to the usual suspects. So instead of having a zinfandel, what about a nice tempranillo instead? Tweaks like that…and wines ranging from $8 to $12 by the glass. The 32-seat space already had cute décor from the last go-round, but they are updating the interior again and will be adding some artwork this week. While they were sorry they couldn’t find someone to carry on the tamale parlor legacy, they still wanted to honor the place’s beloved history by keeping part of the name. They are excited to be there and serve people once again. 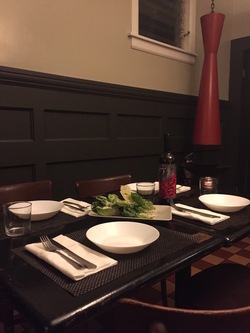 There will be a second round of test dinners this weekend (Thu-Sat)—please note it will probably be cash only this weekend until their POS system is up and running. They will officially be open next week, on Tuesday November 15th. Hours will be Tue-Sat 5:30pm-10pm, or maybe even until 10:30pm if that’s what the neighborhood needs. No reservations (unless it’s for a large party). 2817 24th St. at York, 415-824-2600.